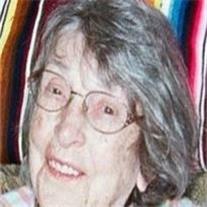 Barbara Ruth Reynolds Kinsky, 91, passed away peacefully in her home in Apache Junction, AZ on Aug. 30, 2012. Barbara was born in Andersonville (Clear Creek), TN on June 4, 1921 to Louis Alcane Reynolds and Lelia Mae Jones. She was a hillbilly girl who had the heart of a lion but was gentle as a lamb. Growing up on a farm in the 20’s and 30’s during good and rough times taught her to be strong and self dependent but also show kindness to others in need. Barbara and her second husband bought a little house in the desert in Apache Junction AZ in 1946 and raised her 3 sons while her husband, Albert, was a school teacher who taught school at Superior for a short time and later at Carl Hayden High school. Barbara and her husband were active members of the St. Georges Catholic Church in AJ and enjoyed their summers in their little cabin in Greens peak Hide-a-Way in northern Arizona. She is preceded in death by her 1st husband, Joseph Traxler, 2nd husband, Albert S. Kinsky who passed away on Aug. 9, 2001, 1st born son, David L. Traxler, who passed away on Sept. 2, 2009, older brother, William Carl Reynolds who passed away on Apr. 7, 2010 in Prescott Valley AZ and half brothers and sisters, Bessie, Lillie H. Reynolds, Conda Lee Reynolds and Ulis E. Reynolds. Survivors include her other two sons, Fred A. Kinsky and Eric F. Kinsky of Apache Junction AZ, two grandchildren, Christopher R. Kinsky and wife Sarah of Show Low AZ, Sara A. Kinsky of San Diego CA, brother, Louie C. Reynolds and wife Bea of Show Low, AZ and little sister, Ruby Mae Reynolds Csuy and husband Paul of Peoria AZ. Mom, your body and mind may have succumbed to the wear of time, but your goodness, love and kindness of others and your spirit will live on in the hearts of your sons and the ones you touched until the end of time. Goodbye and we will miss you dearly! I was in Dave’s Peace Corps group in India. On behalf of all of us from India 30, our sincere condolences.